I have a shelf in my kitchen that is filled with cookbooks. Over the past year and a half it has grown from barely half the shelf to a tight squeeze. Many have been gifts, one or two I have bought new, and the rest have come from used book stores and thrift shops. I think everyone should have a general cookbook that they turn to for when they are faced a new culinary endeavor in the kitchen. Often, this is the cookbook that your mother used. Maybe you use The Joy of Cooking, or Better Homes and Gardens Cookbook. Me? I have a copy of the McCall’s Cookbook. Both my mom and my aunt have copies as well, and theirs show the passage of time in a well-used kitchen with a cover falling off, and a homemade re-binding. Mine is still in pretty good shape but I fully anticipate it becoming stained, folded, wrinkled by spilled liquids, and eventually held together with a rubber band. I turn to my McCall’s for my go-to pie crust recipe (which I almost don’t need a recipe for any more) and every time I make an apple pie. When I’m wondering how to cook something (What do I do with bone-in pork chops again? What flavors will go well with pumpkin?) I almost always start there. Lately, I’ve also found myself turning to Julia Child’s Mastering the Art of French Cooking for answers to some basic questions as well. I like the French twist to everyday basics like a roast chicken or sauteed mushrooms. Sometimes I buy cookbooks for their pictures. A good photograph of a beautifully presented dish can be inspiration enough to get out my knives. Sometimes I buy cookbooks because I’m looking for more information on a specific subject. Peter Reinhart’s Crust and Crumb fits into that description, as do a couple other books on pizza and breads. 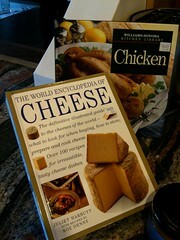 Today I bought what looks like an excellent comprehensive volume on Cheese. Sometimes I look for cookbooks that will complete a set. I’ve acquired seven pretty green-spined cookbooks from the William-Sonoma Kitchen Library on themes from “Chicken” to “Fruit Desserts.” It helps that the recipes look wonderful too! I think that I should start to cook at least one recipe a week from one of my cookbooks. That sounds manageable. And it doesn’t have to be a long, complicated recipe either. Some of them are quite simple, with an ingredient list of less than five or six. My cookbook shelf is a beautiful component of my kitchen and I should be using it! This entry was posted in Cookbook and tagged cookbook. Bookmark the permalink. I have a four shelf bookshelf filled with cookbooks! My standard is the Better Homes and Gardens (paperback edition) and it falls open to several favorites… cornbread, glazed carrots and chicken livers with tomato sauce. Some of my most used cookbooks are for international cuisine like my collection of Thai and Indian cookbooks. I also love the annual books by Cooking Light and Southern Living. I also find myself looking more and more online instead of in my books because I can type in an ingredient or two and instantly have recipe choices. Inevitably I print these off (the successful ones anyway) and add them to my binder. I have started a recipe box at AllRecipes.com that I use as much as I do my cookbooks. Helps to have your computer close to the kitchen though! 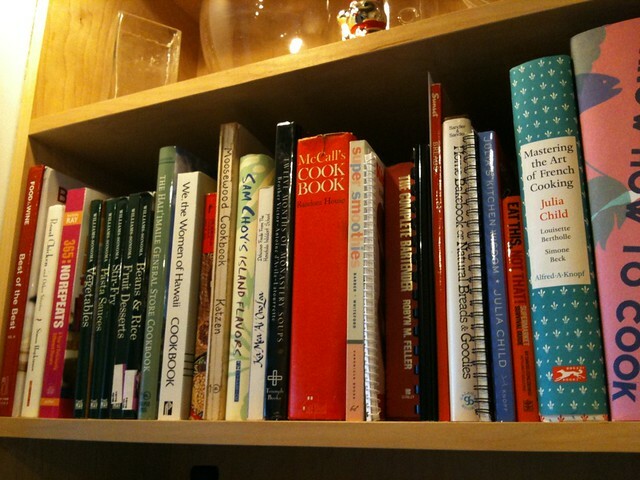 I have shelves of cookbooks and appreciate the ones that give the backstory of the recipe. And when I am trying something totally outside of my comfort zone, I like to see pictures. I even made a holiday cookbook for my cousin last year and painstakingly took photos of every step of the process at Thanksgiving to make it as fool-proof as possible. By biggest cookbook regret was the Joy of Cooking. I had an old, beat-up version from the 50s that I loved and turned to all the time for baking projects when I was first learning. Then, ignorant of the variations in later versions, I bought a brand new copy and tossed my old one only to find out that it was completely different, and the recipes I used to rely on were not there, or so changed I couldn’t recognize them. 😦 I keep hoping to stumble across a version from pre-1962 at thrift stores, but so far, no luck.